Why I married a farm boy. Huh. 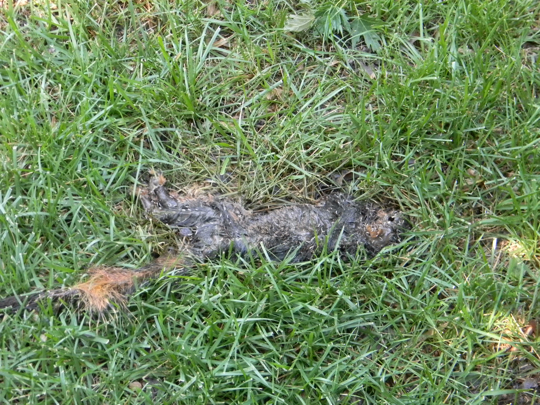 I was going to write a post about a dead squirrel in our yard, but I see I’ve already done that. Oh well, I’ll tell you another one. I actually sat outside and read in the sunshine on Memorial Day. The weather was lovely – a little breezy, not too hot. Eventually I put down my book and took a stroll around the house, admiring all the plants that Brad has planted that have survived our neglect. Brad, you are a miracle worker. Then I saw a dead squirrel and wigged out. I ran inside for a camera and a Lloyd, because you never know when you’ll need post fodder. I took a picture of it. Warning: it has maggots on it. Ok. Don’t say I didn’t warn you. Bleh. I told Lloyd to take care of it, because I am the boss of him. He said “What do you want me to do?” I said, “Get a shovel or something and remove it from my sight.” I was thinking maybe a little grave, or in the compost pile or something. He got a glove, picked it up, and threw it in Brad’s lovely peonies. Brad, are you going to stand for that? That’s a great thing to throw at the feet of the peonies. They will digest it with delight. My garden is full of buried rabbit carcasses that are nourishing the plants and helping produce vigorous growth and beautiful flowers. In my defense, there was very little left of the squirrel -much less than you would think from the picture. It was your basic, maggot ridden, hollowed out shell of a squirrel. Um, do squirrels just wander in your yard & go belly up? At least he had a glove. Out of sight, out of mind. I’m with Brad, that is natures compost. My woods are full of them and you don’t have to see it.